BRITISH COLUMBIA – Toronto’s Seabridge Gold is turning its attention to the Quartz Rise high grade gold target on its Iskut property 110 km northwest of Stewart. 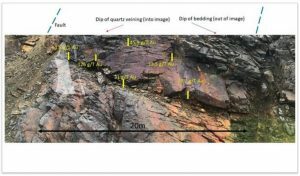 Drilling occurred at Quartz Rise for the first time last year and confirmed the presence of an intermediate sulphidation epithermal system below a lithocap. The company says that new results from cliff face sampling show exceptional gold results that appear to correspond with a favourable induced polarization anomaly under Quartz Rise. A 3,000-metre drill program is planned at Quartz Rise, but it could be expanded if results warrant. Check on the progress of the program at www.SeabridgeGold.net.